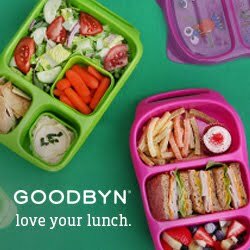 The end of the school year is nearing and it seems the kids are getting more and more excited about the last lunchboxes of the year. Everyone wanted to plan their lunchboxes last night and think about what they wanted and how. My 5 YO wanted a jeep or recycling truck sushi box. Yes, he asked for this and I had no idea and for sure not the skills to fulfill that wish. I ended up making three triangle rice shapes and set them on lettuce. I added cucumber skin for the window and recycling sign and cucumber slices and yellow mini tomatoes as wheels. For him, I also added a few yogurt pretzels, more garden cucumbers and an oat & brownie bar from Trader Joe's. I have a lot to learn but it was fun to make! With a lot of imagination (especially with that of a 5 YO) you can make out the truck, lol. My oldest wanted a homemade Lunchable and got Tortilla chips and Guacamole, some yogurt pretzels and a Pumkin Seed Ciabatta roll with butter and blackberry jam. You are such a fun mom!